Continuing the ongoing trend of anti-government propaganda bringing down the hammer and sickle on your Constitutional freedoms, yet more Patriots are being rounded up by Big Government Comrades for daring to speak out against tyranny. However, I digress. A couple that shares that nausea and bitter taste that I have in my mouth when subjected to the TSA decided to wear t-shirts ridiculing the TSA as they went through airport security. In case you’ve watched too much MSNBC lately, this is [still] legal under the first amendment. Apparently they made it through security okay, but were later approached by an airport agent and then by TSA to ask about the meaning of the shirt. The couple was able to explain it satisfactorily and they were left alone as long as they removed the t-shirts and allowed their luggage to be searched again, which they agreed to. It wasn’t long however before Big Gov returned with a vengeance…and dogs. Additional TSA agents and local security returned and subjected them to even more intense scrutiny including an additional search of all of their belongings and themselves including the use of drug sniffing dogs, more interrogation, having their shirts photographed and being subjected to a background check. Having found absolutely nothing (except maybe that he has the bad habit of leaving the cap off his toothpaste), and seeing that all they had on their hands was simply a married couple traveling home after a relatives funeral and that they presented no threat to themselves, the airport, the airline or the passengers, decided it was time to detain and remove them to an interrogation room and really bring the screws down on this non-issue, and hard! At this point, the Delta pilot objected to the couple coming on the plane simply because of the “consternation” that it was causing passengers. Since I can tell you from first hand experience that most Americans walk through that body scanner like sheep to slaughter, I can see why so many Americans expressed “consternation” about anything they don’t understand because the American public, generally speaking, is pretty stupid. I have no beef with the pilot since both he and the airline can refuse service to anyone and while I am disappointed, as usual, with zombie Americans that allow Government to walk all over them, they do have the right to express concern however unfounded it may be. My beef is with the TSA and the transit police who made a big deal out of nothing which I am sure added to the concern of passengers because nothing makes sheepish white people more nervous than a non-white couple being surrounded by security and TSA agents, interrogated, searched and photographed all while knowing they will be sitting next to you on the plane. If the TSA had done nothing, most Americans are too dumb to have even realized what the shirt was saying. Do you really think most Americans even know what the TSA logo looks like? The TSA made a mountain from a mole-hill and that is what got them kicked off the flight, not the shirt. After being booted from the flight, Guha and his wife were subjected to even more intense interrogation, with transit police demanding to know where Guha’s brother lived because he had originally purchased the t-shirt as a gift. According to the police, it was also suspicious that Guha’s wife did not share his surname. “And she’s your wife? How long have you been married? And she refused to take your name? “WHY wouldn’t she?” the cops asked Guha. After being searched yet again, this time with the aid of a drug-sniffing dog, Guha was told by cops that another reason for him being treated as a potential terrorist was the fact that he opted out of a naked body scan. So, responding to a question with the word, “Michigan” or if your wife did not take your surname when you were married, or if you look foreign, or if you exercise your right to opt-out of the body scanners…you can be detained and interrogated, albeit badly. I am not surprised by anything that Guha wrote, or the manner in which the TSA or the transit police interrogated him. I have personally had several conversations with TSA agents at the airport over my concerns with the full body scanner and there is no shortage of unintelligent, uneducated and even belligerent answers including a few TSA agents that were downright rude and demeaning including one that made fun of me to all the passengers waiting in line behind me. Having personally been a part of this nightmare, I am not surprised at all by Guha’s story. Please be a patriot and choose to opt-out at every opportunity. You don’t need to explain why. You don’t need to engage in conversation with the TSA, in fact you’ll just be disappointed in humanity and our educational system if you do, so I don’t recommend it. You have the right to opt-out and as yet, in the dozens of times I have done it, it has yet to take more than 5 or 10 minutes. It’s really no big deal. I also encourage you to high-five or encourage anyone else that opts-out. I make an effort to encourage others this way and it creates a unity among us. 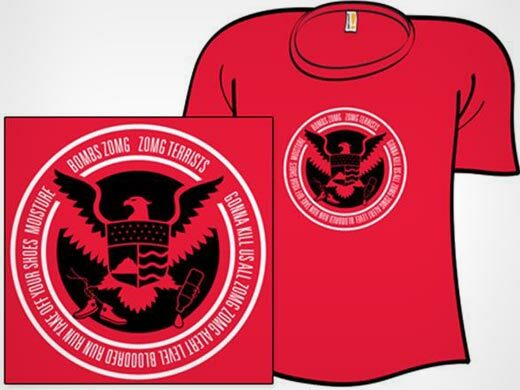 Anti-TSA t-shirts can be purchased here. And as usual, all I did was Google for you…I make nothing off of whatever you buy.